Today I’ll be putting the finishing touches on this corpsepaint face painting. It’s going to be the sixth in the series. I plan to stop at seven. It’s time to move on to some other projects. 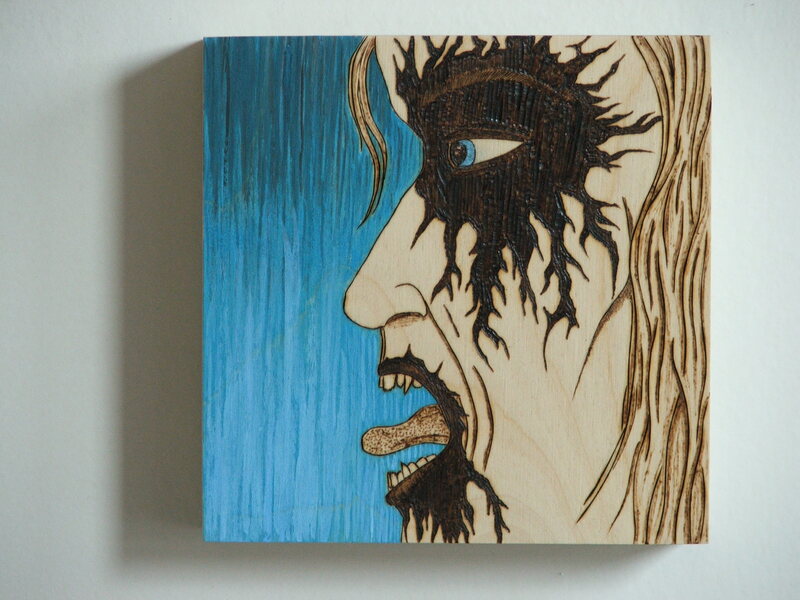 Over the past seven months I’ve been working on and off on a series of small 6×6 inch deconstructed corpse-paint face paintings, experimenting with variations of woodburning and painting techniques. I have five completed so far, I plan to do up to seven. I first debuted these at the Constructor Craft Fair, and I’ll have five of them complete and shown all together on September 15th at the Cigars and Stripes September art show. I’ve also begun listing them in my Etsy shop. I’ll probably be adding one every few days. I once had an art teacher call me “tedious Eric,” because I worked over the tiniest details with careful precision. At least, I think he was referring to that, and not my personality. Anyway, I never broke the habit, as you can see here. This is one tiny part of a larger piece I’ve been working on, and even as I asked myself why I’m focusing so much on this repetitive pattern, I understood that I couldn’t do it any other way. Repetition of patterns is almost meditative, and it allows me to get into a state of mind where I can think through other things, solve other problems even as I focus on the work in front of me. Of course, when I changed over to stippling further down, it broke the rhythm and I started to feel a little fidgety and anxious. 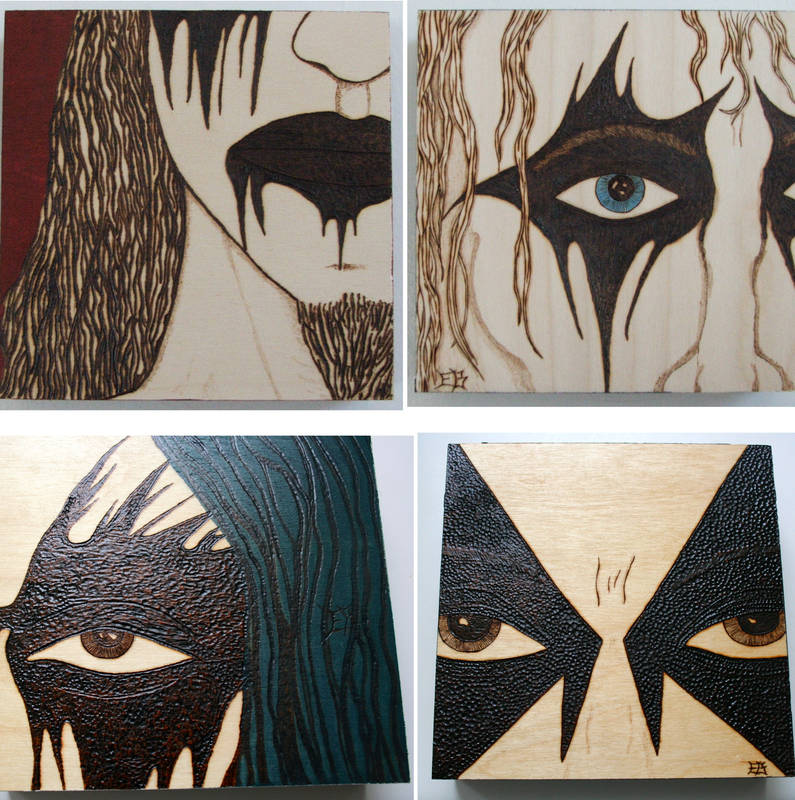 Two weeks ago I was writing about pyrography artists working in an unconventional way. Recently I discovered Scott Marr, an Australian artist who does some interesting work blending natural pigments with pyrography. 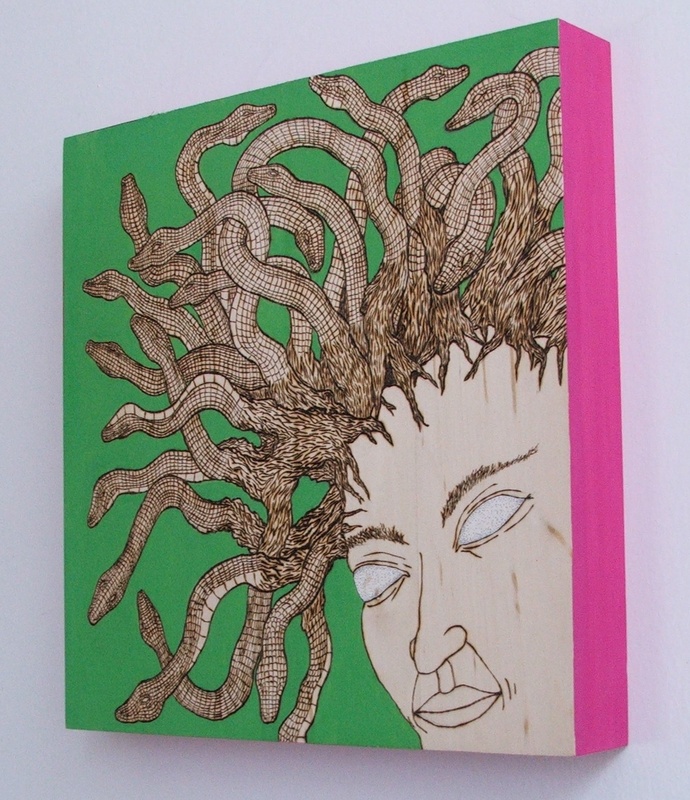 Coming up Friday night, the 50/50 Pilsen art show. This is the second portion of the 50/50 Pilsen show, which explores and blurs the boundary between art and craft. I’m working on the finishing touches for a number of pieces I’ve been preparing this summer. Yesterday I talked about the dearth of pyrographers kicking it up a notch to create a higher art. I found this guy Blair Mclean on YouTube and thought I’d point out his work as an example of the concept that I strive for. He does some incredible straight-line images of architecture and landscapes that kind of put me in mind of art deco and Peter Kuper. Instead of traditional burners, he uses a torch and metal straight edges. This is awesome stuff, check out these videos of his process. I’m counting the days down until the craft fair portion of 50/50 Pilsen, and thinking a little bit about where craft and art meet. Art almost always involves a degree of craftsmanship, unless it’s purely conceptual. The work I’ve been doing recently involves a medium that puts most people in mind of boy scouts, grandparents, and kitschy outdoor country scenes. Pyrography doesn’t have the popularity of, say, screenprinting, and it is far more time-consuming without the possibility of mass-production. But there’s a lot of possibility in the medium, because of the range of possible markings, from fine-detail to thicker, deeper burns. Since the theme of this show is where art meets craft, I’ve been exploring the craftier elements of my woodburning, but really, I’m far more interested in how to incorporate this craft into paintings and drawings. Now, plenty of people consider pyrography a serious art, and so do I, but does it get the same respect as painting or sculpture? This past spring I was at the Art Chicago show at Merchandise Mart, and saw one example of pyrography. 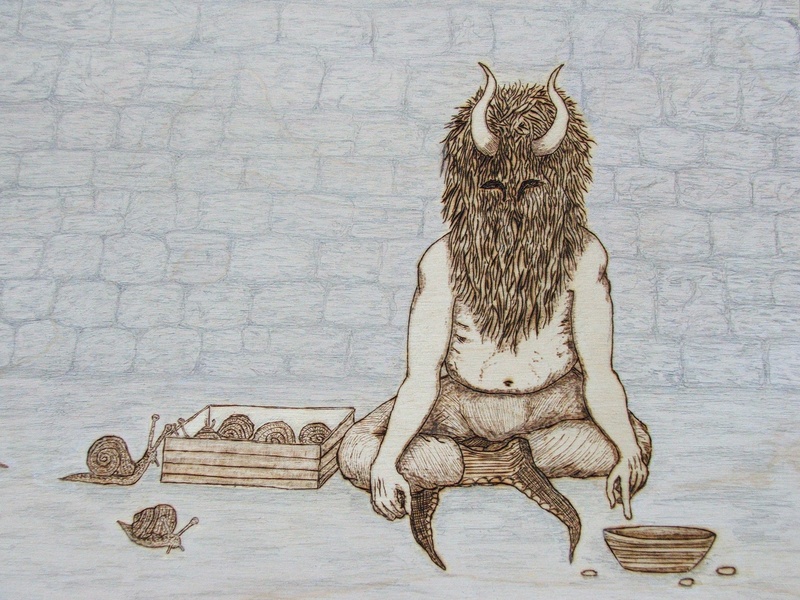 I’ve found a few cool woodburn artists trolling around the web, but ultimately, where I draw the line is whether someone is creating original subject matter with a discernible style. I’ll be interested in hearing some of the comments of the Pilsen arts community, because at this show I’ll be focusing almost exclusively on woodburn art. We’ll see what we’ll see. The big show coming up for me in October is 50/50 Pilsen, which Mandy and friends are putting together. Last year’s show was a huge success, and we’re hoping to build up excitement for this one. While I’ve a few ideas for the craft portion of the show, what I’ve really been focusing on is a body of work for the art opening on Friday, October 14th. These two pieces are mixed media: woodburn on basswood and birch panels, with gauche and pencil. 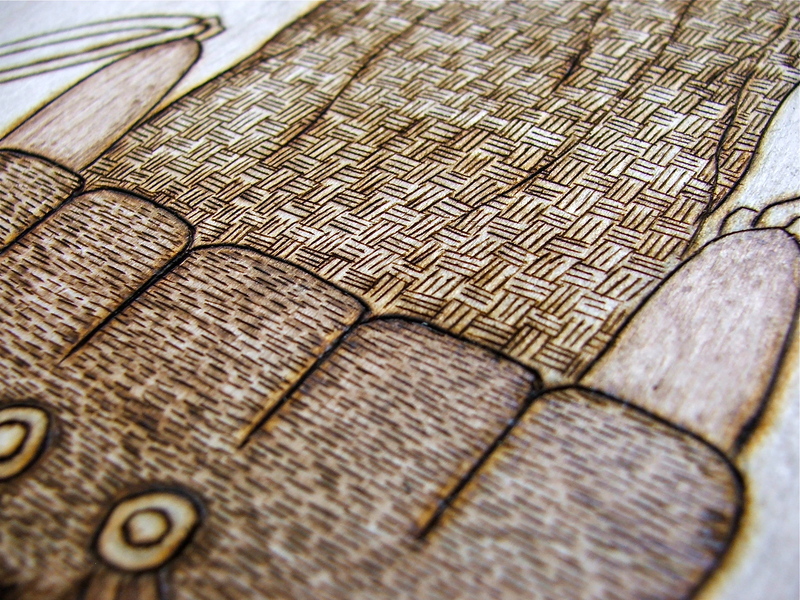 You are currently browsing the archives for the woodburning category.